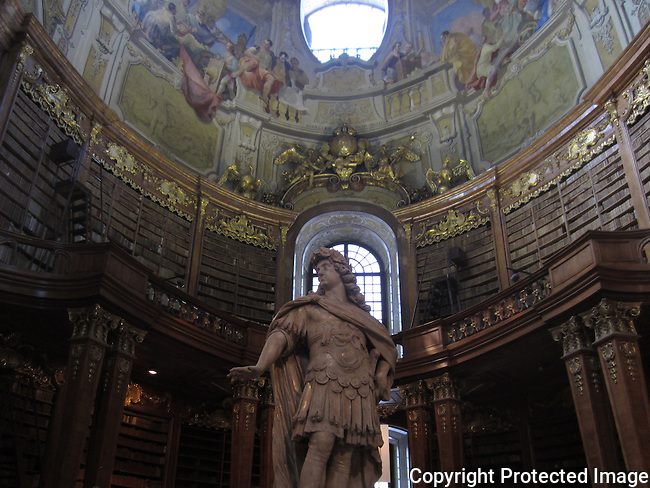 The Prunksaal (English: State Hall) is the central structure of the old imperial library and part of the Hofburg palace. The wing is located in-between Josephsplatz to the north and the Burggarten to the south. The books in the monastery of the Conventual Franciscans (Minoritenkloster) were stored here. The wing was begun in 1721 by Johann Bernhard Fischer von Erlach and finished after his death in 1723 by his son Joseph Emanuel. The hall is divided, after the original list of the books, into two opposite "war" and "peace" sides, which is reflected also in the wall frescoes, from Daniel Gran. The fresco in the central dome represents a kind Apotheosis of Emperor Charles VI, whose image is held by Hercules and Apollo. Around the image of the emperor, several types of allegorical figures meet in a complicated theme, which symbolize the virtues of the Habsburgs and the wealth of their domains. Located in the hall are marble statues of emperors with the statue of emperor Charles VI in its centre, created by the sculptors Peter Strudel and Paul Strudel.